As the autumn weather starts to get colder thoughts turn to comforting warm bowls of homemade soup (well in our house they do!). However, soup is, well soup, however tasty it is, so I thought I would try and improve on a bowl of Soup by adding toppings (this does only work for thicker soup). You've probably seen Onion Soup topped with a crouton & cheese, but you can add so much more, making a meal of a bowl of soup without the need to add bread if you don't want to. 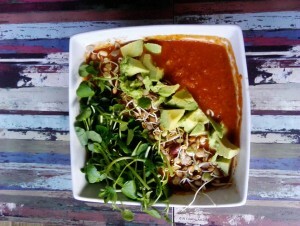 I took my Storecupboard Tomato Soup and topped it with sprouted beans & lentils, chopped avocado and Watercress, which added protein (beans & lentils), healthy fats (avocado), Magnesium and Iron from the Watercress. The takes the humble Tomato Soup and elevates it to a Super Healthy Tomato Soup Bowl. 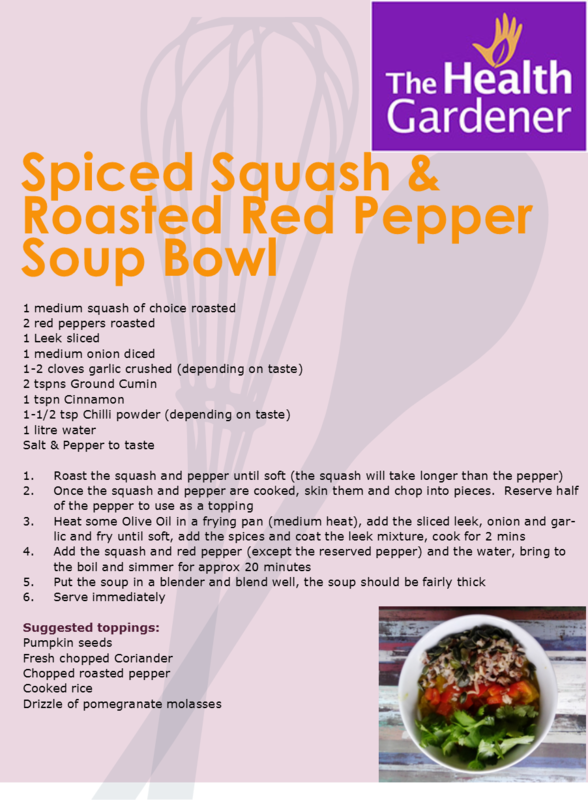 Below is a recipe I developed to use a squash I had. Again I've added toppings to the soup to add protein, healthy fats and extra antioxidants. 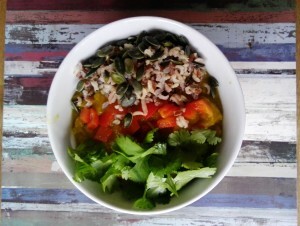 I've used Persian style flavours in this soup for change. Both recipes include leek, onion and garlic, which are all excellent for gut health and, particularly with the Winter looming, support a healthy immune system. I've suggested some toppings for the two different bowls, but you can add whatever you fancy or even, what you have in the cupboard/fridge. Put a selection of toppings on the table and let everyone help themselves to their favourites.